Tableau Public is a platform for data people around the world who are creating and publishing thousands of interactive data visualizations every week. With all those vizzes, it can be difficult to keep up with what everyone is making! We’re excited to share two new features designed to make exploration and attribution easier than ever before. It can be difficult to discover new content and make new connections in the Public community. In 2015 we introduced the ability to follow authors, a feature that shows you all the vizzes those authors create on your Activity Feed. Then in 2017, you could start favoriting vizzes to amass your own collection of inspiration. Now your Activity Feed is no longer limited to the vizzes created by the authors you follow. With the most recent update, you can now see when authors you follow favorite a viz. And lucky for your followers—they’ll get to see the vizzes that you favorite! Want to get started uncovering even more amazing vizzes? Create or sign into your Tableau Public profile. Follow at least one author (check out our Featured Authors or see who’s behind our Vizzes of the Day). Click on Activity, and watch the favorites start to flow into your Activity Feed! Part of the magic of Tableau Public is that it gives all authors the opportunity to leverage and build upon each others’ work. In order to help keep Tableau Public collaborative, we have added an attribution feature that allows you to link to the author or viz that inspired your work. This link will be displayed under the viz’s metadata for all community members to see. From your profile, click on any viz. 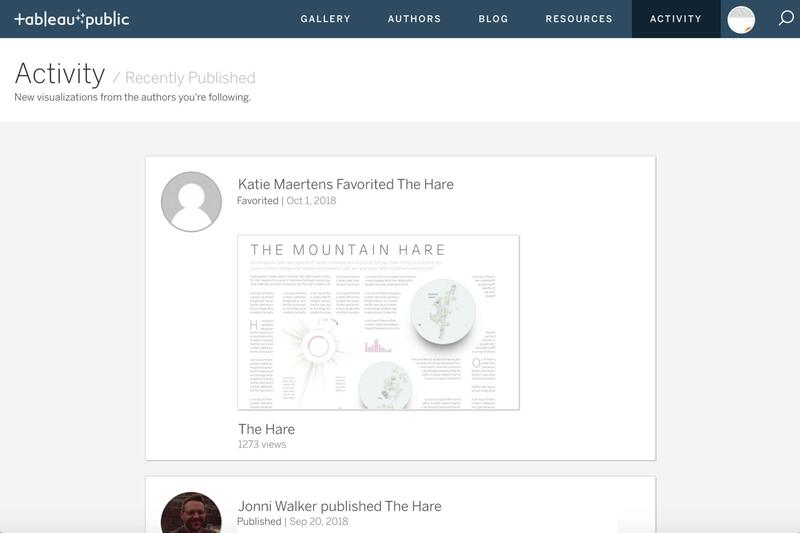 In the “Inspiration” field, add a link to any viz or author profile on Tableau Public. It’s your feedback that makes these features possible! If you are planning to attend Fanalytics at TC18, our team will be awaiting your feedback! Can’t make it to Fanalytics? Post to the Ideas Forum with your ideas on features for Tableau Public. We hope these features will help you discover new content and grow your network.